The last of the Kachari Kings, Raja Gobind Chandra was assassinated by a group of seditious persons with the help of some of his personal attendents on April, 24, 1830 at Haritikar. In absence of natural heirs, his territroy lapsed to the british under the terms of an agreement executed in 1826. Mr. T. Fisher, as army officer was sent to take charge of the territory with the power of a collector and magistrate and he took over charge on June 30, 1830 with Headquarters at Cherrapunji. In 1833, the Headquarters were shifted to Dudpatil and then to Silchar. Plian portion of Cachar was formally annexed to the british dominion on August 14, 1832 by a proclamation of the Governor General in council. Mr. T. Fisher was Gazetted to the first Post of the Superintendent of the District. He unfortunately died while in service and was succeeded respectively by Messers I.G.Burns, E.R.Lyons, E.S. Person, P.G.Vener and others. In 1854 North Cachar was annexed to the British Dominion after the death of Senapati Tularam and tagged with Cachar. In 1874, Cachar was included in the Chief Commissionership of Assam as per proclamation of Feb'6, 1874 and the post of Superintendent was redesignated as the Deputy Commissioner and Mr. R. Stuart was the first DC of the District. Hailakandi Sub-Division was formed on June 1, 1869. As a result of partition of India in 1947, four Thanas of Erst While, Karimganj Sub Division of Sylthet District were transferred to Cachar. The District of Cachar is located in the Southernmost part of Assam is one of the oldest district of Assam. It is bounded on the North by Barali and Jayantia hill ranges, on the South by the State Mizoram, on the East by sister district Hailakandi and Karimganj. The district was created in 1830 after annexation of Kachari Kingdom by British. In 1854, North Cachar was annexed and tagged to the district. In 1951 erstwhile North Cachar Sub-Division was made a separate district and taken out of Cachar.In 1983 erstwhile Karimganj Sub-Division and in 1989, Hailakandi Sub-Division was made a separate District. The Kacharis gave this name Cachar when they ruled this land. The word Kachar in Sylhette (Bengali of Sylhet) means a stretch of land at the foot of a mountain. Hence the name Cachar might have been given by Bengalies of Sylhet as the land is surrounded by mountains. In December, 1706, the Kachari King Tamradhaja, whose capital was at Maibong on the bank of the Mahur River,was invaded by the most powerful Ahom king Rudra Singha. Being defeated by the Ahom King, Tamradhaja fled southwards to Khaspur.From this time onwards the Kachari princes seemed to have settled in the plains of Cachar, their court being located at Khaspur. 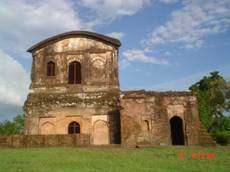 The Kachari King Suradarpa Narayan set himself to recognise the people and improve the capital Brick buit palaces and temples were constructed in different parts of Khaspur. It is said that the demoness Hirimba, whom the second Pandava Bhima married, resided in this place. Hence the kingdom was named Hirimba kingdom in memory of the demoness. 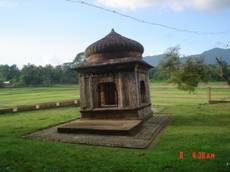 The first connection of British with the District dates from 1762, when Mr.Verelst marched from Chittogong to assist the Manipuri king Jay Singha who had been driven from his throne by the Burmese and halted with his army at Jatrapur near the present Silchar town. The army remained there for about a year, but due to death and disease among the army, Mr Verelst could not proceed further and was ultimately recalled. The next historical event of importance was the formal conversion of King Krishna Chandra to Hinduism in 1770. A few years later last prince Gobinda Chandra was driven from throne by Marjit Singha of Manipur with the help of the Burmese. Afterwards the Burmese drove Marjit Singha from this place to Surma Valley. But the British Govt. which was in possession of Sylhet expelled the Burmese and handed back the district to Gobinda Chandra. In return he was required to pay an annual tribute of Rs.10,000. 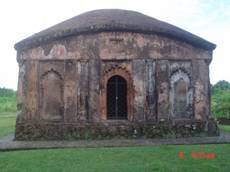 The king then shifted his abode to Haritikar, but in 1830 he was assassinated by batch of Manipuri murderers. In the absence of a natural heir, this territory lapsed to the British Govt. under the term of a treaty executed in 1826.This district was formally annexed by the proclamation of August 14,1832. 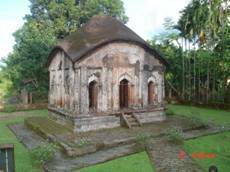 Cachar was a part of the greater Kachari Kingdom which also included the adjoining Hailakandi and Karimganj districts. The Last King of Cachar was Raja Govindrachandradwajanarayana Hasnu. 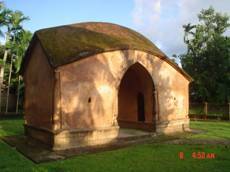 During his period Khaspur was the Capital of Cachar(Kachar). Cachar was another native kingdom that fell victim to the imperialist design of the British. The Kingdom of Cachar was being ruled two rulers having clearly defined areas of control. In the plains (southern portion of Cachar) Govindrachandradwajanarayana Hasnu was the ruling prince. Immediately after his assassination by Gambhir Singh the British annexed it to their dominion in India (1832). Tularam was the ruling chief of the hilly tract (northern portion of Cachar or Dima Hasao). His territories were annexed after he died in 1854. Thus entire Cachar came under the British occupation. While south Cachar was annexed under Robertson, the hilly tract of Cachar came under British occupation when Jenkins was the Commissioner of Assam. The history of the district includes the active participation and support of its people in the Indian freedom movement. Many leaders, such as Kamini Kumar Chanda, his son Arun Kumar Chanda and Abdul Matlib Mazumdar etc., led the people of the district to fight for the cause. While Chanda was instrumental in garnering support of the Bengali Hindus, Mazumdar was one of the prominent Muslim leaders of Eastern India to oppose the partition of India on communal lines. Mazumdar, along with Fakhruddin Ali Ahmed, (who later became the 5th President of India) became the most prominent Muslim opponents to the demand for a separate Muslim state of Pakistan, especially in the eastern part of the country. To counter the rising popularity of Muslim League, he successfully organised the Jamiat Ulema-e-Hind movement in Assam. Jamiat was an ally of the Congress having a mass following among the nationalist Muslims. In the very crucial 1946 General Elections, conducted just on the eve of India’s independence, he wrested the Muslim majority Hailakandi seat from the hold of the Muslim League. That victory virtually sealed the hopes and aspirations of the Muslim League to include southern Assam, including Cachar, in Pakistan. Assam's Surma Valley (now partly in Bangladesh) had Muslim-majority population. On the eve of partition, hectic activities intensified by the Muslim League as well Congress with the former having an edge. A referendum had been proposed for Sylhet District (now mostly in Bangladesh). Mazumdar along with Basanta Kumar Das (then Home Minister of Assam) travelled throughout the valley organising the Congress and addressing meetings educating the masses about the outcome of partition on the basis of religion. On 20 February 1947, Mazumdar inaugurated a convention – Assam Nationalist Muslim's Convention at Silchar. There after another big meeting was held at Silchar on 8 June 1947. Both the meetings, which were attended by a large section of Muslims, paid dividend. He was also among the few who were instrumental in retaining the Barak Valley region of Assam, especially Karimganj with India. Mazumdar was the leader of the delegation that pleaded before the Radcliffe Commission that ensured that a part of Sylhet, the present Karimganj district, remains with India.. Arun Kumar Chanda did not join Bordoloi cabinet in 1946 but preferred to do social work as a legislator and also to uplift the premier educational institution, G.C. College. Unfortunately soon he died leaving a huge vacuum of an able Bengali Hindu leader with a secular bent of mind. The entire eastern India was swept by violence just after India's partition and independence on 15 August 1947. Scores of Hindus had to flee the newly created East Pakistan for India and Muslims fled Assam for East Pakistan. A large number of people lost their lives owing to violence, which resurfaced with more ferocity in 1950. Mazumdar, the only member from the undivided Cachar in the cabinet, along with his cabinet and party colleagues took up the responsibility for the safety of both Hindus and Muslims in Cachar, touring affected areas and arranging camps and rehabilitation for the refugees, organising supplies and security. In 1960s, Moinul Haque Choudhury, who was a cabinet minister in Assam from 1957 to 1966, became a prominent political figure in the district. In 1971, he became the Industry minister of India under the Prime Ministership of late Indira Gandhi. Late Arun Kr. Chanda's wife Jyotsna Chanda also represented Silchar in the parliament. 1 July 1983 saw the creation of Karimganj district by curving out the eponymous subdivision from Cachar. This was repeated in 1989 with the creation of Hailakandi district.